Hi Pauline, can you describe the factory? What were Walters like to work for? This was my Great Grandfather’s firm. Some of this is news to me. Will the author please contact me. It’s great to see your comments. Nathan Walters was my grandfather. My father, Charles, was his youngest son and also worked for the company. I was born in 1964, a few years after Nathan died. My half-brother, Michael B Walters, is still alive and well and in his 90s. I’ve gathered a few insights about the business from him over the years. I would love to correspond with you. I live in Ottawa now but am regularly back in the UK. The famous geographer Brian Berry offers some thoughts about his dad’s work at Walters’ Palm Toffee in the book Geographical Voices. (He’s not very complimentary about them!) You can read it on Google Books. I would love to be in touch with Victor Bloom and also William Walters. My maternal grandparents were born in Botsani and died before I was born in l936. After the war we used to visit Auntie Lilly who I think was married to an Arthur Walters. She lived in a big house in Acton and we always went home with a big bag of broken pieces of Palm Toffee. 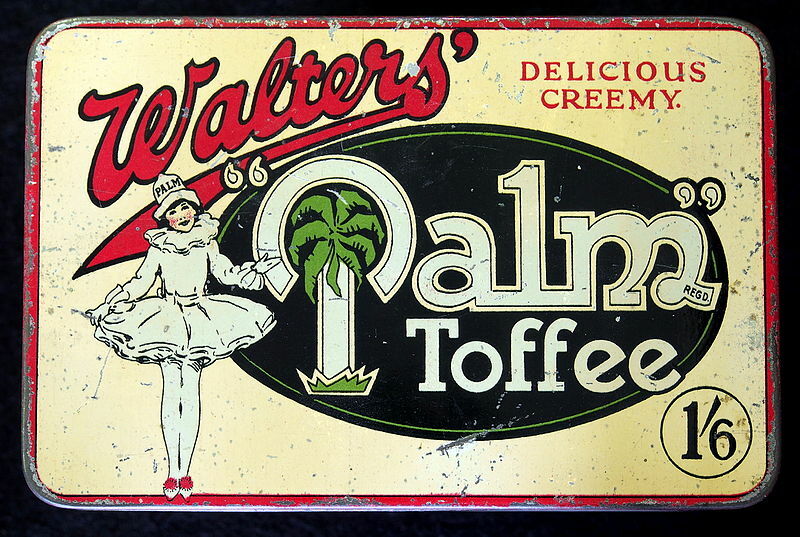 As a child I was always thrilled to see trays of Palm Toffee in sweet shops and loved the little hammer you could use. My grandfather Harris Finklestein was I think working at the factory when he was introduced to, and married, my grandmother who was nee Jessie Greif. It was an arranged and unhappy marraige. Both my parents worked there pre-war. My Father went back after the war and worked there until 1960. Mr Smith was the works manager and Michael Walters was the owner at that time. My father was a sugar boiler and his name was Cliff Hawkins, he is now, of course, deceased. 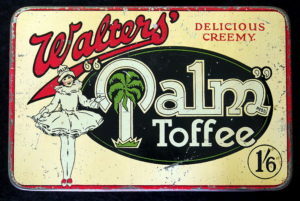 I have an old Walters toffee tin with a blonde lady wearing a red strapless swimsuit with a large straw hat in her hand.. does anyone know what year this tin was produced?.. I’ve searched the net but unable to find anything like it.